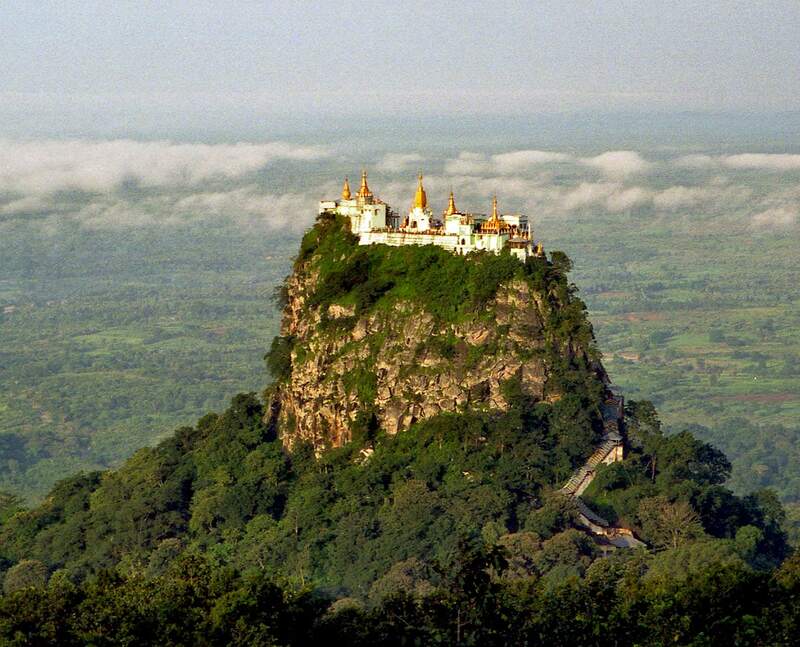 One of the most sacred places in Burma is Popa Taung Kalat – incredible monastery perched on the top of cliff. 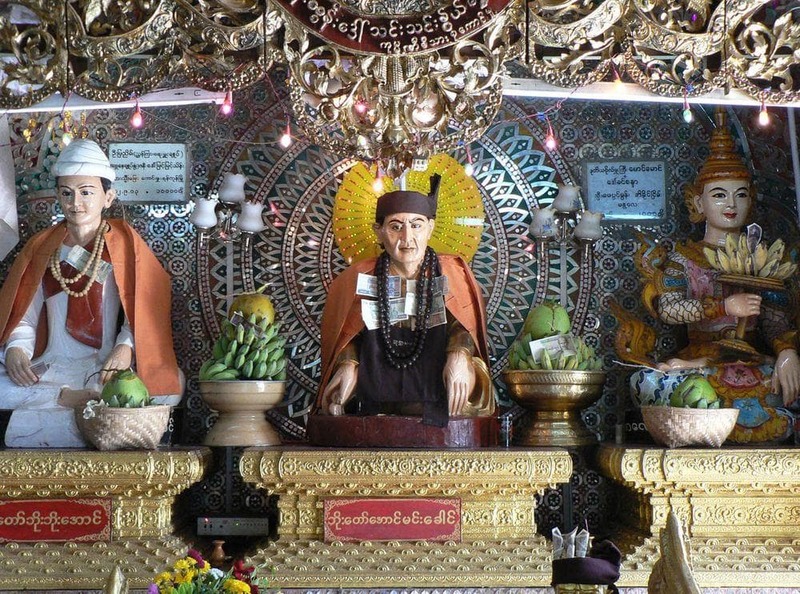 Burmese pilgrims come here to worship nats – sacred spirits. Mount Popa is a solitary volcano. Taung Ma-gyi – the highest summit of the volcano is 1,518 m high, rising more than 1 kilometer tall above the surrounding dry plains. Mountain is high enough to have another vegetation zone – in the fertile volcanic soil grows lush tropical forest which is famous thanks to countless fragrant flowers. Most likely flowers gave the name to the mountain – "Popa" in Pali means "flower". The landscape is refreshed by many small springs and streams. Last eruption of Mount Popa took place in 442 BC, what is not that long ago by the standards of volcanoes. 4 km to the west from the main summit of volcano is located a weird cliff – Taung Kalat (pedestal hill). 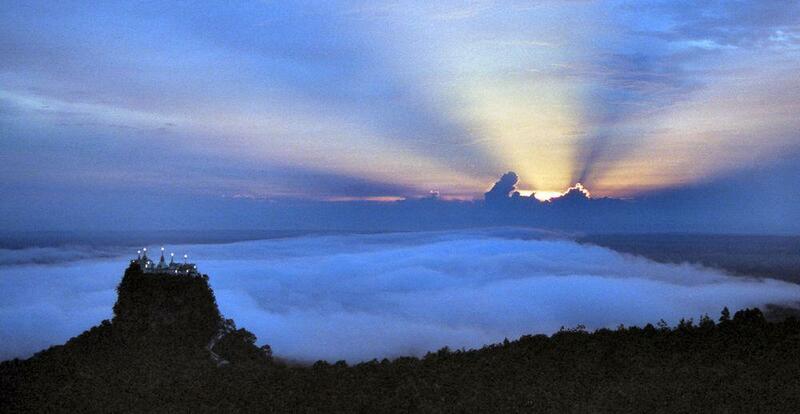 It rises almost vertically some 170 – 180 m above the surroundings. Top of this cliff is 737 m above the sea level. This is volcanic plug – magma which once upon a time hardened in former crater of volcano. This magma has been harder than the surrounding volcano, which has eroded away, leaving the magma plug standing. This giant volcano and the smaller Taung Kalat can be seen from far away, even from the Ayeyarwady River 60 km away. Such a prominent, unusual natural landmark had special importance to local people. 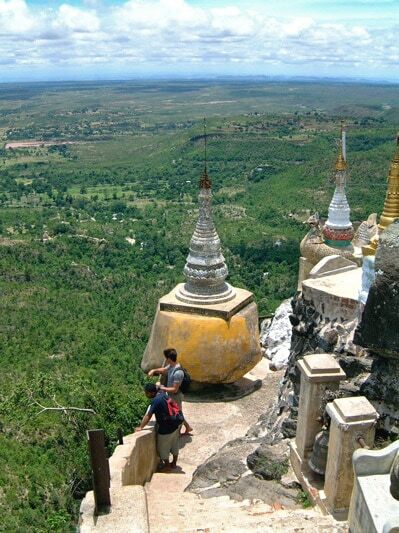 Most likely Mount Popa was a sacred place very long ago, before the Buddhism, but it got bigger importance with the rise of first states in the surrounding plains, when the mountain became the sacred place for the kings of Bagan. 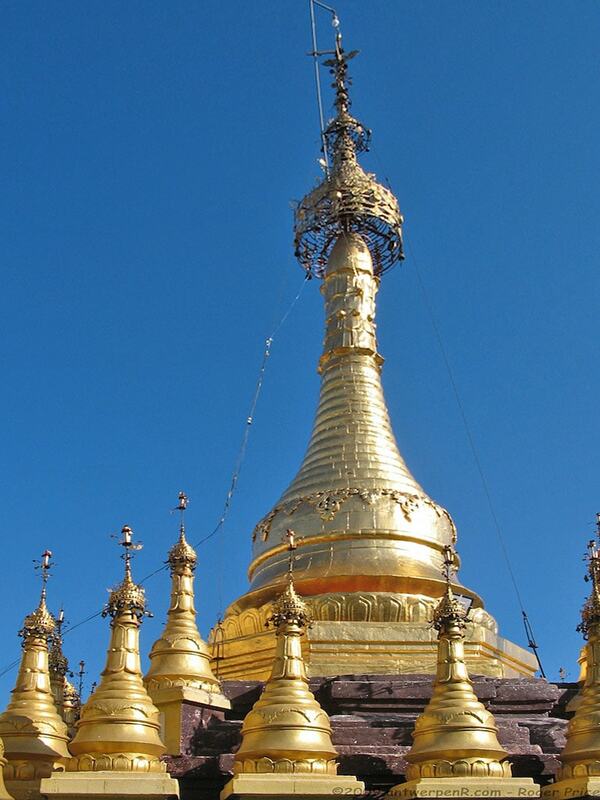 Mount Popa was declared to be the abode of the most important spirits – Mahagiri Nats. Today it is national park. According to the tales before the king Anawrahta (1044 – 1077) hundreds of animals were sacrificed here as a part of nat worship rituals. Nats are worshipped spirits in Burma – an interesting syncretism (consolidation) of Buddhism and animism. It is well possible that nats have been accepted in Buddhism as an earlier animist belief in rural Burma and this belief was used by kings of Bagan to unite the nation. Nats are very diverse: there are personal guardians, home spirits, spirits of forest or streams. But 37 nats – Mahagiri Nats – are important for the whole nation. These 37 nats are spirits of people who died in violent death. It is well possible that these were real people whose life stories are legends today. It would be an interesting discussion about the fate of Burmese society today and its link to the worship of defeated tragically killed people. Taung Kalat plays a great role in these legends and it is considered that the hill is abode to four of these Mahagiri Nats. Most ancient events have been recorded in the legend about Maung Tint Dai – Blacksmith. According to legends, this mighty man lived here in the 6th century BC (another version – in the times of Bagan king Thinligyaung in 344 – 387). He was very strong and the king wanted to get rid of Blacksmith. King sent a message that sister of Blacksmith is declared a queen. When Blacksmith came to the city to congratulate his sister, he was caught and burned alive under a tree. His sister heard of this and in despair jumped in flames and died. The half-burned tree became an abode of the nats of Blacksmith and his sister, and everyone who walked under the tree was cursed. King ordered to uproot the tree and it was thrown in Ayeyarwady River. People found it and carved images of brother and sister in it. Later kings of Bagan started the pilgrimage to Mount Popa to worship nats of Blacksmith and his sister. Since then this mountain became sacred. Nat of Blacksmith was declared to be the Domestic Lord of the Great Mountain and ruler of the mountain. He is still worshipped in many families. In the 11th century a flower-eating ogress (?) lived on Mount Popa. This lady was called Me Wunna (Mel Wunna). Mount Popa was frequently visited by the fast-runner Byatta. This fabulous man was in the service of the mighty Bagan king Anawrahta (1044 – 1077). Byatta was running to Mount Popa and back to Bagan (50 kilometres!) some 10 times per day in order to supply the king with fresh, fragrant flowers. Byatta and Me Wunna fell in love and they had two sons. When Anawrahta learned about the affair of Byatta, poor Byatta was executed. Me Wunna died of broken heart. Both Me Wunna and Byatta are some of the most powerful nats now and they live in Taung Kalat. Sons of this pair were living in the wild after the death of their parents. 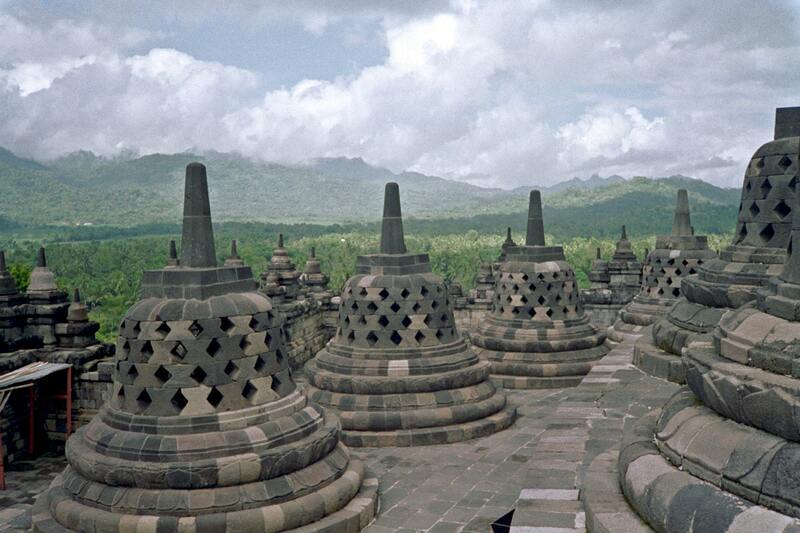 Their lives were tragic as well – they were executed for their neglect in the construction of pagoda. Spirits of brothers are nats as well, they live elsewhere. Taung Kalat turned into an important pilgrimage site for Burmese coming to worship nats. Monks still live here. Especially many people come here in the full moon at Nayon, at the end of May / beginning of June and in Nadaw – end of November / beginning of December. At the base of the cliff are several villages. Statues of 37 Mahagiri Nats stand at the foot of the cliff and through an ornate building starts the stairway to the top of the mountain. Stairway has 777 steps. Those who ascend it, are rewarded with a fabulous view. To the noth-west opens a view to distant temples of Bagan, but to the east is towering the forested Taung Ma-gyi summit. On the top of hill is built a complex of beautiful buildings with five gilded pagodas. Many macaque monkeys live here – and are happy to get some food from tourists. The site was revived in the early 20th century by the efforts of U Khandi (1868 – 1949) – a hermit and organizer of the development and reconstruction of several Burmese monasteries. There are many beliefs about the mountain, locals tell many stories about ghosts (Weikzars and Zawgyis) seen here. In order not to offend nats, one should not wear black, green or red, when coming here. Visitors should not bring meat, especially pork. Thanks to the diversity and richness of plant life, this is an important site for herbal doctors as well. There is also a belief that army, which is gathered on the slopes of Mount Popa, is undefeatable. Evelina Rioukhina, Legend of the Mount Popa, UN Special, March 2003. Accessed on July 28, 2012. Comparatively seldom visited by foreign tourists, Burma (Myanmar) though is gorgeous, very diverse country with rich cultural and natural heritage. Many little known landmarks are out of reach to general tourists and – possibly – not discovered yet, but some of those which are known better, belong to the most surprising landmarks in the world. The practice of Buddhism in Myanmar (Burma) has resulted in the production of dazzling objects since the 5th century. This landmark publication presents the first overview of these magnificent works of art from major museums in Myanmar and collections in the United States, including sculptures, paintings, textiles, and religious implements created for temples and monasteries, or for personal devotion. Many of these pieces have never before been seen outside of Myanmar. Be dazzled by Buddhist architecture in Yangon, explore Bagan’s amazing plain of ancient temples, or hike to the floating gardens and markets of Inle Lake; all with your trusted travel companion. 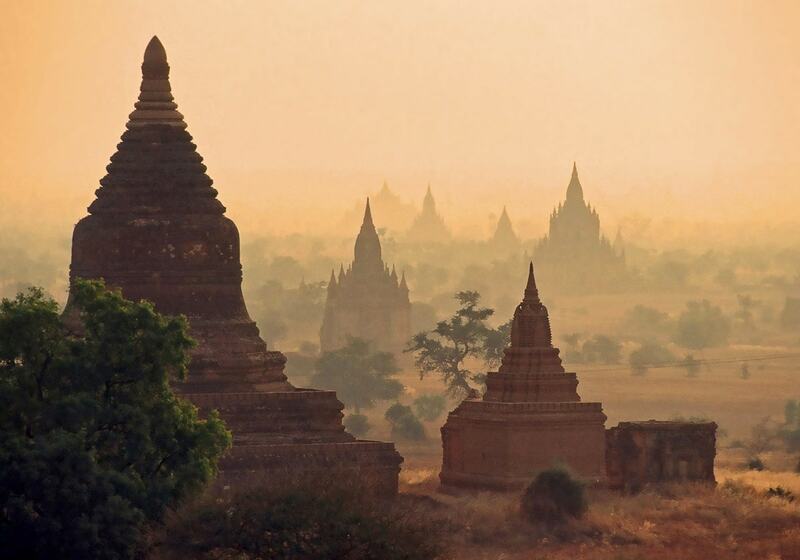 Get to the heart of Myanmar and begin your journey now!